Sometimes you can just tell if you're going to be lucky or not, can't you? Well, an Intertops Casino player had a feeling she was in for a good night recently and boy was she right! When she hit a $12,048 jackpot on a $2 bet almost as soon as she sat down to the computer, Tanya S had a feeling she was in for quite a night. By the time she logged off she’d won more than $55,000 in payouts. A clerk in a shipping office, Tanya said she'll use some of her winnings to pay off her credit cards but will leave some in her account so she can play some more casino games. Tanya hit her first big jackpot of over $12K playing Crystal Waters. Then she switched to Golden Retriever where she had a $5027 win in the main game and won a couple of thousand in the free game feature as well. She also played the Lions Lair and Triple Twister slots that night. With her jackpots and numerous other wins, her payouts that night totaled more than $55,000. “When I won that big jackpot it scared me at first because of the purple fireworks box that pops up!” Tanya told her Intertops Casino VIP Rep. “Then the reality of what just happened kicked in and so I called my husband over to feel my pulse. He did. He said it was a little fast. I said ‘Ya wanna know why?! ?’ and pointed at the computer screen. He said ‘Nice, but are you going to cash it out?’ I laughed and said ‘Well, most of it’." 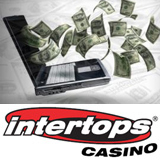 Intertops has been known for more than 15 years for its friendly customer service and no hassle deposits and withdrawals. Players around the world enjoy more than 300 casino games at Intertops which also operates a popular online poker room and sportsbook.